If you’re in the cinema industry, the name “Dolby” will sound very familiar. The company has been at the cutting-edge of cinema sound since sound in movies began. Dolby’s early work included noise reduction for the classic Stanley Kubrick movie, “A Clockwork Orange”. Since then, Dolby’s technology has progressed to stereo, then surround sound and eventually digital surround sound was born. Dolby’s never ending quest for the ultimate in immersive cinema sound has seen their audio technologies being employed for over 30,000 movie titles. Their latest advance in cinema sound technology comes in the form of Dolby® Atmos™. This new platform is intended to give filmmakers complete creative freedom when producing their soundtracks. Moviegoers will now be able to experience soundtracks and cinema acoustics exactly as they were intended to be heard. 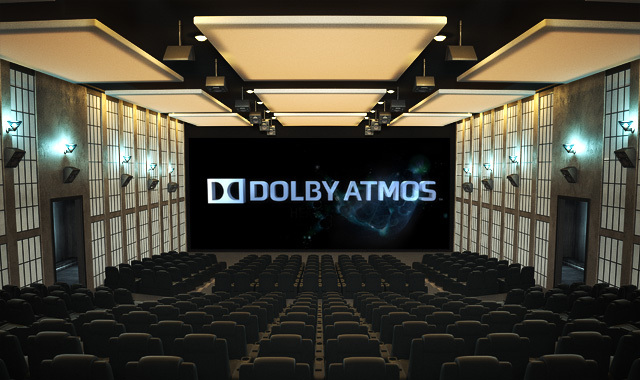 Dolby Atmos employs overhead speakers in addition to surrounds, creating a natural, realistic sound experience. The sound can move around the theatre to create dynamic effects. The result is a lifelike cinema audio experience that uses up to 64 speakers. Atmos is a departure from the current 5.1 or 7.1 channel based audio systems, which just direct sound to different regions. It uses more than 64 lossless audio channels to create 128 dynamic audio elements. This means that sound designers aren’t limited to directional effects as they can now work with moving objects. The sound can be positioned anywhere, and can completely envelop the audience in a realistic way. It was recently announced that Dolby Atmos will be used in the film “The Hobbit: An Unexpected Journey”, which is set to showcase the latest in cinema technology (by the way, did you know we’re doing the refurb/fitout of the cinema hosting the world premier of the Hobbit in New Zealand?). Details are extremely important to filmmakers, and Atmos gives them complete control over the movement and placement of sound, so the audio is a perfect match for the on screen action. The Hobbit’s Director Peter Jackson had said he wants people to actually feel like they’re part of the experience, rather than just observing his films, and Dolby Atmos will go a long way in helping him to achieve this. The transition to Atmos is a painless experience and installations are scalable. Each installation is different, and it’s a bespoke job that takes room shape, the incline of seating and possibilities such as balconies into account. Dolby has begun the rollout in earnest, and while this process is slow, as with any new technology, Atmos is bound to make the whole movie experience more fun.